Visitors to Santa Cruz over the past few months may have noticed the slightly bizarre sight of an increased number of people whizzing around town on electronic tricycles, bikes and scooters. 18.11.2014 - The capital has seen a clever initiative quickly take off and scores of people light-heartedly rolling along the streets has given the city a much-needed quirky boost. EcoDrive Canarias, an established electronic vehicle shop in Santa Cruz, has recently opened a marquee just 300 metres from the port, directly in front of the passenger terminal, where they offer their services directly to passengers, tourists and passers-by. This plum positioning has attracted huge attention and is proving to be both colourful and highly successful. As well as a novel and practical way of nipping around town and avoiding Santa Cruz’s frequently chaotic traffic problems, it is also, of course, enormous fun; and can be enjoyed with friends or alone with just your to-do list to keep you company! You can choose to rent an automated or peddle-powered vehicle and freely cruise around at your own pace, or you can take one of EcoDrive Canarias’ organised city tours. They offer personalised excursions along the seafront where you can visit local attractions such as the Botanical Garden (palm trees) and Parque Marítimo (swimming pools complex). Other services include entrance and guided tour of the Auditorium, bus sightseeing excursions around the city, and personalised routes for private occasions such as birthdays, anniversaries, etc. 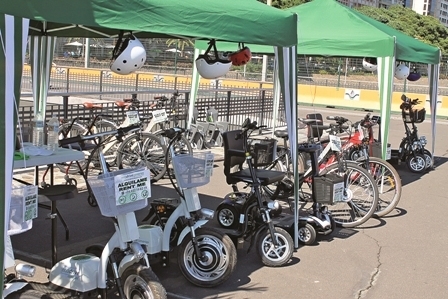 The vehicles available to rent include: electronic tricycles, electronic bikes, rural bikes, electric scooters and mobility scooters; so if you’re big or small, energetic or lazy, they have something for everyone – baskets optional! Prices are very reasonable, with rates starting at €30 for the whole day or €15 for three hours. As well as their marquee stand, EcoDrive’s shop can be found at Edificio San Francisco on the Paseo Milicias de Garachico, just across the road from the port, near to Plaza España. They also have a website containing further information and pricing. You can find them at: www.ecodrivecanarias.com, or call on: 922 198 219.